Greece Soccer Team - EURO 2004 Champions - Traianos Dellas - by La Cancha-News On World Cup 2006 - "World's Leading Soccer Magazine!" A superb man-marker whose determination compensates for an occasional lack of agility, Traianos Dellas is at his most effective when operating as a sweeper in a three-man central defence, demonstrated to victorious effect at UEFA EURO 2004. Part of the Greece side which lost the UEFA European Under-21 Championship final to Spain in May 1998, it took Dellas three years to finally make his full debut in a friendly against Croatia in April 2001, subsequently securing a place in an increasingly watertight back line. He was involved in five of the clean sheets in EURO 2004 qualifying, and his performances in helping Greece to victory in Portugal - including the dramatic semi-final silver goal against the Czech Republic - earned him a place in the All-Star Squad to go with his winner's medal. 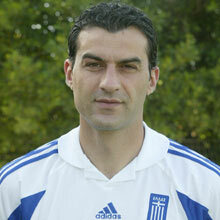 He started out at FC Aris Thessaloniki in the 1993/94 season but only really made an impact at the club in 1996/97. Before that he spent time on loan at Panserraikos FC, where he tasted both relegation from and promotion to the Greek second division. 1997: In the summer of 1997 he completed a 3m move from Aris to English first division side Sheffield United FC. Dellas returned to Greece two seasons and 27 league appearances later to join AEK Athens FC and played 40 games for the club before being lured by the bright lights of Italy's top flight. 2002: After figuring in just eight Serie A matches for AC Perugia during the 2001/02 season, Dellas once again became restless and left Umbria under a dark and acrimonious cloud in July 2002. Juventus FC and Perugia had agreed a deal for the Thessalonika-born defender, but Dellas had his heart set on a first-team football at AS Roma. 2003/04: That was not the case, however, as Dellas played just 14 times as Roma finished runners-up to AC Milan. His first two dismissals both came in his first season in Rome.